Leasing a property such as an apartment is an alternative way to housing than buying a house itself. Buying a house are high in terms of cost and it is mostly paid on a per installment basis. That is why more people opt to rent apartments than buy a house while they are starting their careers. It is cheaper and more convenient since they don’t have a growing family yet. It is also advisable to rent a small space when you are living alone or with another person. 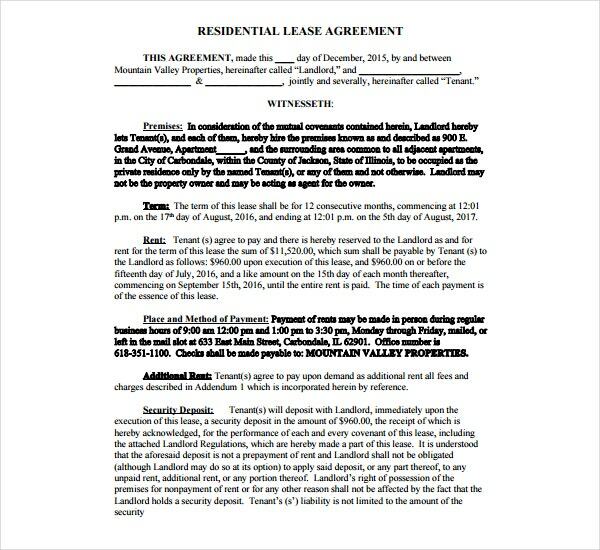 Renting a place to stay needs an agreement templates. The tenant and the landlord have so many things to talk about. 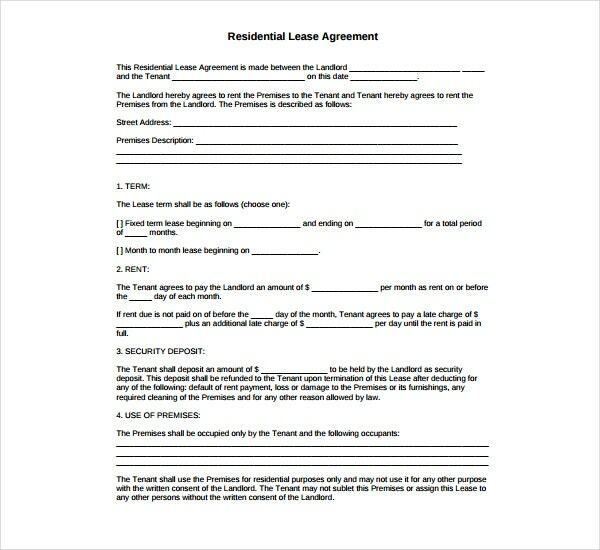 A residential lease agreement must be signed by the tenant and the landlord to set things straight. In that document, the rights and responsibilities of both parties are determined. 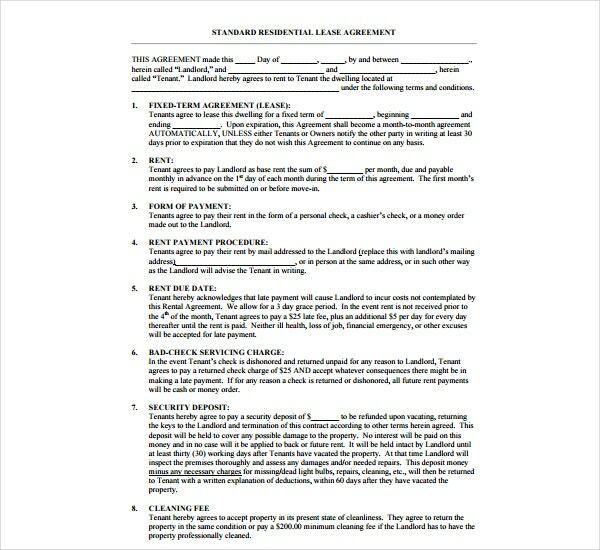 This sample agreement is done before the tenant can settle in on the new property and start over with his life again. Now that the agreement is in your hands, you need to do some further reading. This is a big help for you to understand what the agreement is about, what you can do while it is effective, and how it will protect you in case of trouble. 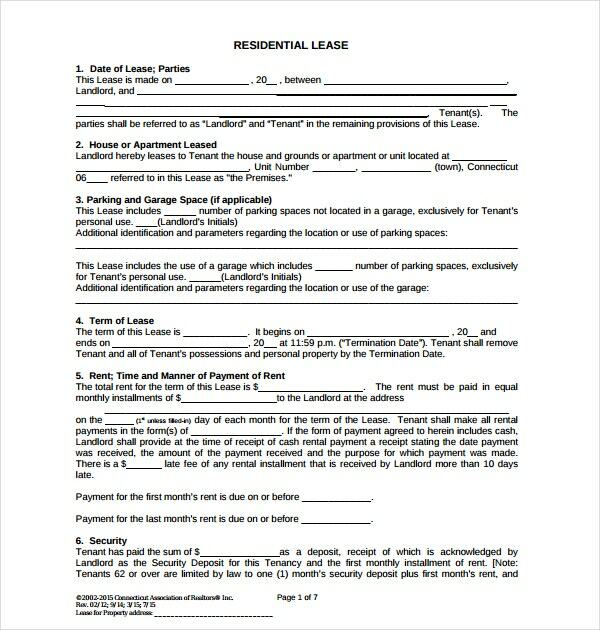 You may also see rental lease agreements. 1. Names of the parties. The names of the tenant and landlord have to be identified. They are identified as tenant and landlord throughout the whole agreement. It is a basic part to identify their names in the agreement since their signatures will be on it. Their addresses and contact numbers have to be identified as well. If the tenant has a roommate, their names have to be written as well so they can be shared with the responsibilities. In the case of a family with children, the parents are only named as the tenants. The children are still not held responsible for the whole agreement. 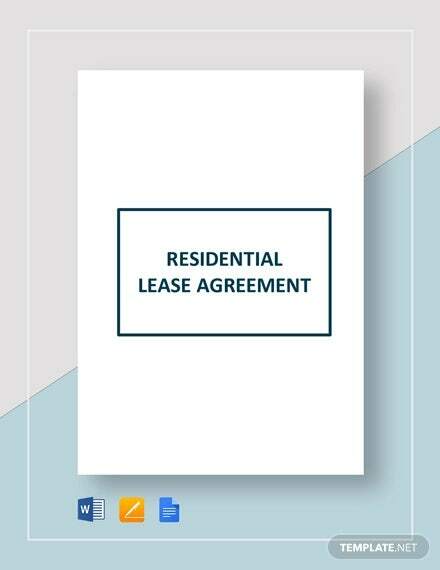 You may also see sample residential rental agreements. 2. Information about the property. All the information related to the property you’re renting must be present in the agreement. This includes technical measurements like the number of square meters. For residential leases, the description of the building and the number of bedrooms and closets should also be included. If the property is located in a complex with several similar units, the floor plan is attached to the agreement. The street, town, state and the postal code of where the property is located should also be identified. Some property owners do not reside in the same complex you are residing in. The person showing you the property when you had plans of renting it might not be the owner as well. Make sure to get the name and number of any contact person related to the landlord. He is the one you should call if there are any problems while you are renting the property. 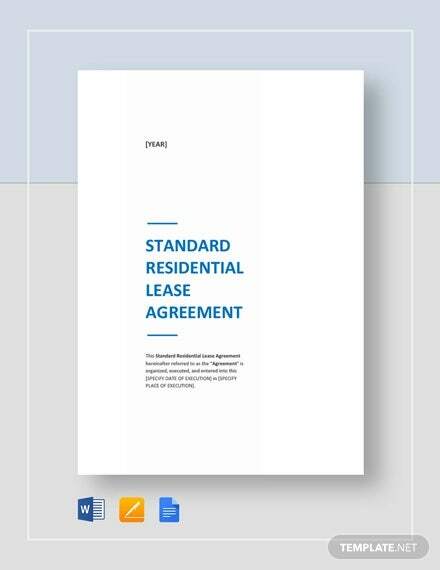 You may also see residential lease templates. 4. Amount of rent and payment schedule. One of the most important parts of this kind of agreement is the amount of rent that you have to pay and when you should pay it. It is scheduled at the beginning, middle or end of the month. More commonly, rent is paid on a monthly basis. There is also what they call grace period in paying the rent. It is the few days allowance of paying the rent if you can’t pay on the due date. Do not forget to look for that part of the agreement. The grace period in paying the rent can range from 5 to 15 days. You may also see simple private lease agreements. 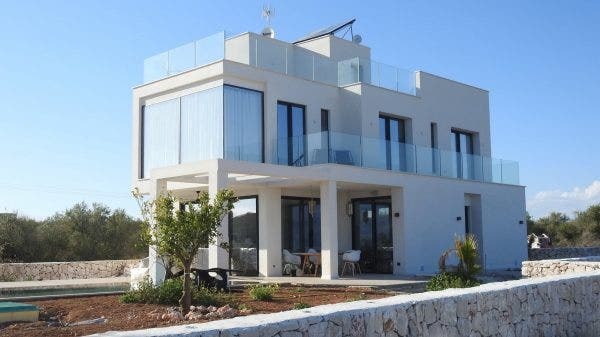 However, it is important not to rely on grace periods since you need a good record when you want a referral from him in the event of renting another property. There are also penalties for late payments. Take note of each of these and avoid them as much as possible. Rent may increase in the coming years. It’s better to know about it and be prepared. 5. Start and end dates. The starting and ending date of the lease must be determined in the agreement. This states how long you can rent the property and when you can start moving in. If the property is empty, the landlord will let you move in right away. You may also see blank rental agreements. 6. Notice of lease renewal. Before the agreement expires, there is a 30 to 60 days notice for you to renew it. It is usually optional. Check if this is in the document. There are things that you must do when you wish to renew the contract. The days provided in the lease can be used for you to negotiate with your landlord on the revised lease. 7. Utilities and maintenance responsibilities. The party responsible for paying the utilities and maintenance responsibilities should be determined in the agreement. If the landlord pays for the utilities, it is a huge blessing for you. You can save a lot of money since it is a separate payment from the rent. The lease should define the utilities included. Find out if the maintenance responsibilities are shouldered by the landlord. The tenant can be responsible for minor repairs while the landlord does more extensive work in maintaining the property. 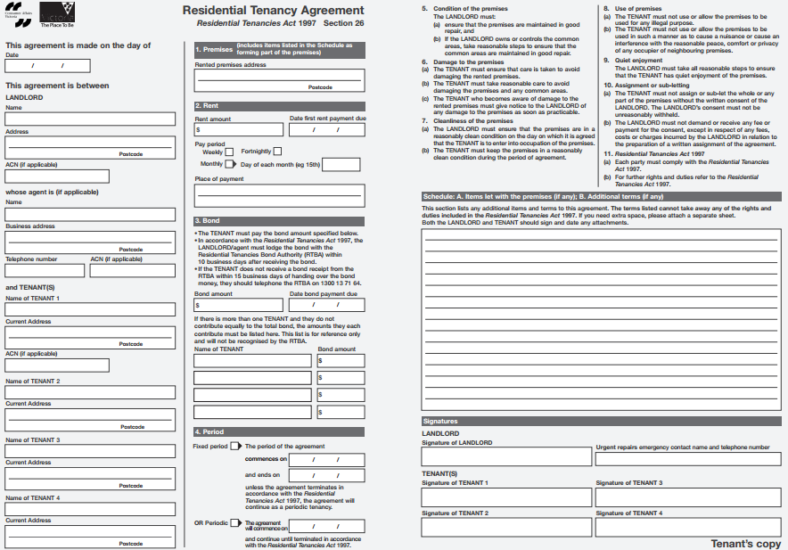 You may also see rental agreement form templates. Find out if there are other services provided by the landlord in the lease. Some of these services include the use of laundry and pool facilities. Trash removal is also included in the service and one of the most important ones. 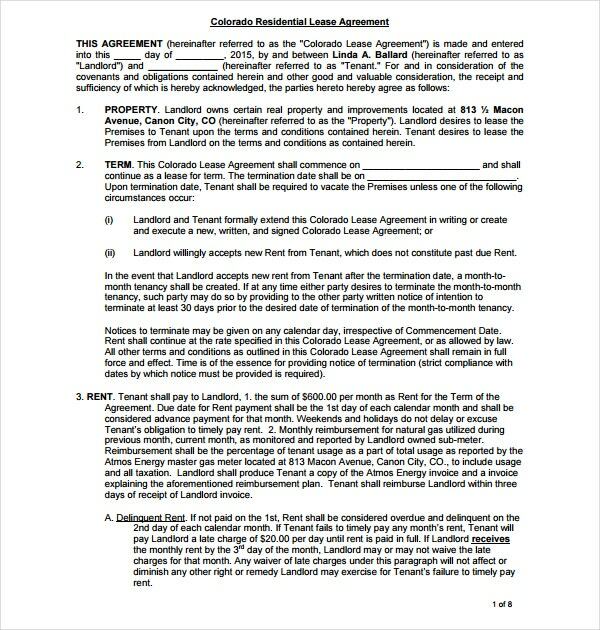 You may also see simple rental agreements. 9. Statement on a security deposit. Security deposit means the money you pay to your landlord. It is worth a month of rent and the landlord keeps it until you leave. Read the rules of handling the security deposit thoroughly and demand an explanation on when the landlord returns the money to you. 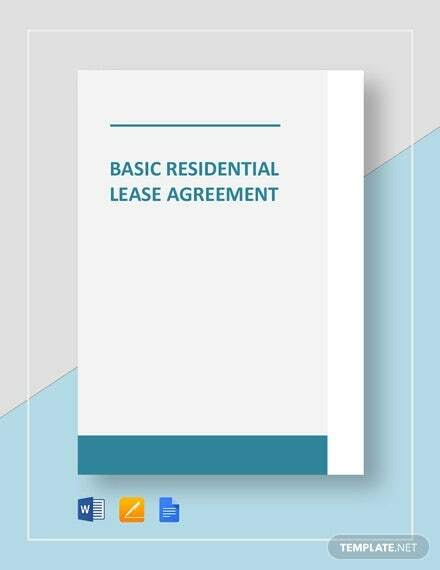 The residential lease agreement is important for both the tenant and the landlord. For the tenant, it is his protection when a lawsuit comes up after a misunderstanding with the landlord. For the landlord, it is his assurance that the tenant will pay the rental fees. Both have to abide by what is written in the agreement. It is a must that both parties understand the entirety of the agreement before putting their signatures on.